Raz-Lee announced numerous new products and features in June 2010. As the year closes, we are proud to announce an updated version of WideScope for large installations with Help Desks, new features for several existing products and some exciting developments which will be released in the first quarter of 2011. A new release of WideScope that support SOX regulations is now available for download on our website. WideScope is a unique product which provides essential capabilities to Help Desk and support personnel ("Supporters") at remote workstations. With WideScope, user's screens can be viewed in real-time, including all information typed and not yet "Entered"! Supporters can execute commands, for users, remotely and the user session's QTEMP library and interactive jobs can be viewed by the Supporters. Read more here. With this new release of WideScope, you have another great product which can be sold to large banking, insurance, telco, industrial, etc. companies with IT Help & Support Desks! Firewall will include a unique approach to securing client applications, more details to come! FileScope/Visualizer, another Visualizer-ready application in addition to Visualizer for Firewall, for Audit, for AP-Journal and for output of Queries. i. This unique product has been requested by many of our distributors and a prototype version can be demoed; please contact me for further details. 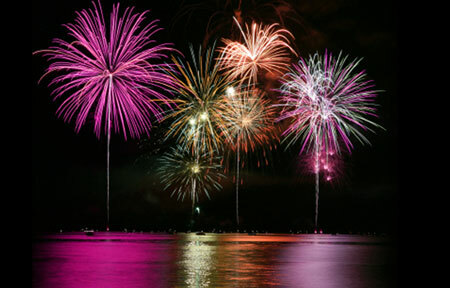 The outgoing year, 2010, was a very successful one for many of Raz-Lee's distributors. In the US, Software Engineering of America (SEA) sold numerous iSecurity packages to large and small customers alike, and was especially successful at replacing competitive products from Bsafe and Powertech at strategic companies; in one case, ISecurity replaced Powertech at a health-care related company which has more than 100 servers! Replacement deals occurred in Europe as well, with strategic wins in Argentina, Nicaragua, the UK, Sweden, Italy, Japan... and in Israel. These sales often resulted in published case studies, for example at Bridgestone in Australia, HSH-Nordbank with our UK business partner Northdoor, YKK, IRSAP, Day Ristoservice and the Bank of Sardegna in Italy, Toyota Boshoku in the US, a leading hospital in Belgium, Promedico and Menora Insurance in Israel and elsewhere. Finally, in what may be a valuable "tip" to distributors worldwide, sales in Israel during 2010 focused particularly on AP-Journal, Authority on Demand and...our unique Syslog interface! Yes, we sold our Syslog capabilities to large Israeli financial companies enabling them to interface with their RSA, Arcsight and HP OpenView SIEM products! Thanks to all for making 2010 a great success! Thanks to our worldwide distributors and their efforts, Raz-Lee is the ONLY security company to participate in IBM Italy's Smart Solution initiative, which is an IBM pilot project to be expanded worldwide. In Japan, Raz-Lee was invited to participate with IBM Japan in offering security solutions for the IBM Japan PRPQ 5799-OAS (Open Application Server) offering. Raz-Lee is now an IBM Premier Business Partner and earned the "Ready For Power Systems" certification. See the 2 logos on the right side of this newsletter. In a month or two expect to see a spotlight article in IBM Systems Magazine on the iSecurity implementation at Promedico, which will focus on this medical-devices supplier's use of AP-Journal to manage and control their warehouse, sales and related applications! During 2010 Raz-Lee expanded its distributor network into countries such as France, Sweden, Norway, Germany, South Africa and Holland, while at the same time furthering our relationships with existing distributors worldwide. We hosted many tens of over-the-web training sessions for distributors, actively participated in live (US, Europe) and virtual conferences, hosted distributor training in Israel and traveled to select distributors for on-site distributor and customer training. Have you had a look at Raz-Lee's YouTube Channel? We've got 7 short GUI and Visualizer related demo movies waiting for you and your customers. Use these to promote iSecurity to YOUR customers. Have you seen iSecurity on LinkedIn? Be sure to FOLLOW iSecurity and let your customers know about this as well! We've updated the iSecurity data sheet which you can download here. Finally, we've gathered some really important IBM i links which will benefit you and provide real value to your customers. The "Tip & Trick" we're about to present can save your customers/prospects a HUGE amount of time and money. In fact, one very big insurance company invested almost two years to send all Audit entry types to Syslog; they could have done this in 5 minutes (!) using the following iSecurity Audit feature. 1) From the Audit main menu, enter Option 81 and then Option 22: QAUDJRN Type/Sub Severity Setting. This screen shows all Audit Types, Entry Types and Sub Types and, in column 1 under "Opt", has a pre-defined Severity Level which users can change. 2) Now, from the Audit main menu, enter Option 81 and then Option 31: Syslog Definitions. Specity "Y" for "Send Syslog Messages", specify a "Destination Address", and then, by specifying a severity level in field "Severity range to auto send", all appropriate Audit Types defined on the Option 22 screen will automatically be sent to Syslog! Note that the format of the Syslog message is specified in field "Message Structure". If you'd like to consult with our Technical Staff regarding how Audit and Syslog can easily be used to interface to your customer's SIEM systems (such as RSA enVision, ArcSight, HP OpenView and others), please let me know. Use these unique features to close more deals! Raz-Lee Security is the leading security solution provider for IBM Power i, also known as iSeries or AS/400, servers. Raz-Lee is headquartered in New York, with offices in Israel and Italy, and has over 26 years of exclusive IBM Power i focus. 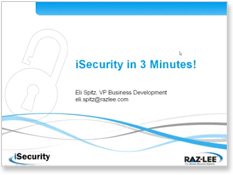 Raz-Lee's flagship product suite, iSecurity, is a comprehensive set of security and compliance solutions for iSeries servers which enable companies to protect and monitor their valuable information assets. Raz-Lee's solutions also enable enterprises to comply with the requirements of the Sarbannes-Oxley (SOX), PCI and HIPAA security regulations, and with COBIT implementation guidelines. Raz-Lee's many thousands of customers worldwide include many of the largest companies in Europe, the Americas and the Far East. Worldwide distribution channels support the company's international clientele. Raz-Lee is an Advanced IBM Business Partner, carries the IBM Server Proven certification and partners with IBM in numerous markets worldwide. iSecurity, End to End Security Solution for IBM System i.